This Article of the Month for May 2018 is written by Abdulvahit Torun, out of FIG2018 Congress country host Turkey. The paper provides a view into application facilities of blockchain technology for cadastra and land registration. In this environment of the digital world, the owners of data are no more centralized. Data from multiple sources has to be reconciled for accurate decision making where a new data sharing, de-centralized data approving, quality assurance and data delivery model and mechanism needed. Besides, democratization and decentralization of spatial data among multiple institutes and even individuals compel the Global Cadastre Community to search, find and realize new approaches where ‘data owner is the king’. In our study, we introduce the problem of inconsistent boundary determination in between succeeding cadastre surveys and a methodology that prevents employment of boundary change into land registry without common and joint approval of all stakeholders. In this paper, after presenting the problem of two distinct physical boundaries which is represented as a unique edge in the cadastre data, a blockchain methodology based on a hypothetical case study is proposed to prevent such occasions. In the proposed geodata enabled blockchain model, there are three components in a blockchain node that are loosely coupled, namely ‘blockchain database’, ‘middleware’ and ‘GIS/CAD’. The ‘blockchain database’ handles the communication and trace of transactions, ‘the middleware’ handles a lossless geo and non-geo data transaction and ‘the GIS/CAD’ component handles the geometrical part of blockchain cadastre survey. In the architecture of ‘blockchain database’, there are three levels in a hierarchy to control and mutually decide on any transaction by approval of relevant participants in accordance with the land registry and cadastre organization as a trusted node watching the procedures. Our work mainly contributes, use of blockchain technology to minimize the inconsistencies between successive surveys caused by incautious considerations and application of cadastral regulations at surveying and data manipulation phases in order to minimize the mistakes that cause unsolvable problems at cadastre surveying phase and has to be handled at cadastre courts. There has been great evolution in the surveying, data processing and data management technologies in geospatial information sector ranging from robot total stations to mobile mapping among others. With the new geoinformation systems technology, public officials and professionals are provided with better accuracy and efficiency which enables insight understanding, precise modeling and correct decision making in operations. However, ownerships, rights and privileges had been defined and managed on land, properties and estate for more than few centuries after the first modern land registry and cadastre works. The physical representation of the defined rights in the registry has been maintained in peace by the stakeholders namely owners of the properties and the state authority -usually- namely an organization of land registry and cadastre, unless any of the participants agree on written formal documents and physical reality. Despite, new technology provides sub-centimeter accuracy to determine the boundary and extent of properties and land, usually a discrepancy between layout of documented coordinates, edges, areas with the physical reality. Many of the countries, handle and manage land registry and cadastre data separately to prevent an occurrence of conflict between legislation and modern cadastre surveys. In such an environment, the contemporary, up-to-date cadastre data is used for any type of modeling, applications and administration as well as a representation of properties and estate with a ‘general’ boundary. Those countries which don’t care the slight and vulnerable line between property rights established in a time when the surveying was not as precise as today over a dynamic Earth under tectonic and other environmental stresses, may face with various problems such as ‘losers’ or ‘winners’ due to newly computed areas of properties, boundary disputes due to data which is not compliant with the physical reality among others. The states having supreme authority, law and order might manage such an un-stable environment with a cost of thousands of court cases, court expenses and a cascade effect which triggers one each other. Louwman, W. (2017) and Fetai (2015), gives two examples for the given cases from Netherlands and Macedonia. In our study, we introduce the problem of inconsistent boundary determination in between succeeding cadastre surveys and a methodology that prevents employment of boundary change into land registry without common and joint approval of all stakeholders. In this paper, after presenting a case study of two physical boundaries which is represented as a unique edge in the cadastre data, a methodology based on blockchain technology is proposed to prevent such occasions. In the proposed blockchain model, there are three levels in a hierarchy to control and mutually decide on any transaction by approval of relevant participants in accordance with the land registry and cadastre organization as a trusted node watching the procedures. In this study, a hierarchical blockchain architecture has been proposed for shared management and updating of cadastre data where non-of the partners and stakeholders have a dominance over the data, processes and procedures which is named ‘a relaxed hegemony’. The second chapter of this study, introduces the blockchain technology, its relevance with land registry and cadastre, the data and the methodology that is proposed in this study. Chapter 3 gives an extensive evaluation of cadastre works regarding the new technology, new user needs and importance for global problems, and conclusions. Blockchain technology and blockchain databases has been used in finance and banking sectors where transactions are stored permanently. There are only few examples of blockchain research and application in land registry field from Sweden, Georgia, Honduras and Ghana. Honduras is piloting a land registry using blockchain technology, while in northern Ghana an organization (Bitland) has begun implementing a land registry (Vos, 2016; Dijkstra et.al (2015). Vos (2016), gives a structural approach for land registry transaction processes and how blockchain fits with them. Dijkstra et.al (2015) states that, blockchain technology is suitable for land registry and cadastre. Chachkhunashvili (2016) states that National Agency of Public Registry NAPR of Georgia has started the use of blockchain approach for land property transaction where a Certified Authority-CA watches all processes and all the transactions and digitally signed files are protected in a chain of blocks as long as the CA is trusted. The signed PDF can be validated offline. Bal (2016) reports the international efforts on blockchain studies as well as a view of Indian Registry from the perspective of potential benefits, ideas for a pilot project and the future of Indian Registry from the blockchain perspective. The Lantmateriet-Sweden (2016) reports, Lantmateriet (The Swedish Mapping, Cadastre and Land Registration Authority) conducted a project which covers Today’s land registry and real estate transactions as well as general aspects of blockchain technology in Today and in Future and a pilot project to create an application that would use blockchain technology to facilitate transactions which is mutually executed by several stakeholder such as real estate agent, bank, buyer, seller, and the Lantmateriet. The pilot application performs the same procedure of current tedious process where all information about the property (current owner, cadastral surveys, among others) which have been digitalized already is put into the blockchain process flow. Current studies on surveying the technology, projects and applications are all concentrated on land registry. However, the determination and setting the boundaries between the properties are conducted by certified cadastre surveyors in evidence of property owners to be registered in land registry as an indispensable part of booked title deed. The previous works mainly handles use of blockchain technology in land registry for several reasons including efficiency in property transactions, keeping track of land registry in digital formats, digitalizing the procedures of transactions of properties, maintaining the registry in a lossless database, recording the transactions in an environment of un-trusted state governance among others. The scope of our work is using blockchain technology to minimize the problems caused by incautious considerations and application of cadastral regulations at surveying and data manipulation phases. The surveying mistakes and unsolvable problems at cadastre surveying phase needs be handled at cadastre courts that is costly. Our study provides a three component - ‘blockchain database’, ‘middleware’ and ‘GIS/CAD’- and hierarchical blockchain architecture. In this work, we give brief information on the database model, data structures, relationships, data flow and data manipulation of all three components at a broader ‘conceptual modeling’ level. This broader view provides the reader to have overall picture from the point of blockchain technology and helps to grasp a complete and consistent understanding. Besides, we handled the component of ‘GIS/CAD’ (Temporal GIS/CAD Engine for Land Registry and Cadastre of Blockchain) in detailed in order to come up with an initial implementation of ‘GIS/CAD’ component. Although the functionalities and participation in the proposed architecture are given in the paper for completeness, the other two components -Blockchain Transaction Engine and Middleware- will be handled and implemented separately, in further research and studies. Either prioritizing secure real estate market or taxation, the cadastre systems facilitates for a framework of registering cadastral parcel with the information of landowner, legal position of person/parsons regarding the parcel, legal rights of person/persons to use the property and a link to parcel geometry described in the cadaster data which has a unique ID number that binds cadaster and land registry (ISO 19152, 2012; FIG, 2017). Cadastral systems and organizational structures of land registry and cadastre differs from country to country due to various reasons such as history, culture, economy-politics, geography among others. The error-prone characteristic of cadastre survey and processes and land registry operations (property transaction) could not be linked to the chosen cadastral system or organizational structure. Rather, the vulnerability of cadastre and land registry transactions are mostly corresponding to the excellence of cadastre and land registry infrastructure as well as development level of overall country. The organizational structure has more impact on un-stable infrastructure of cadastre and land registry in low developed or developing countries, where the state institutes might make changes on the cadastre and land registry that is naturally under constitutional protection. From the organizational point of view, there are multiple organizational models to conduct ‘land registry’ and ‘cadastre’ works. Due to historical and political systems, the task of cadastre is loosely or tightly bound to land registry under the same organizational structure. In one category, these two tasks are undertaken in the same organizational frame –organization for land registry and cadastre-, such as the system in Turkey. In the other category, the tasks are handled by two separate organizations in the countries such as Germany and Netherlands. In the federative political systems, these roles are shared by national and federal bodies (Gundelsweileri, 2007). The tightly integrated/merged land registry and cadastre functionalities under the same roof of an organization (Land Registry and Cadastre-LRC) yields economy and efficiency for creating up-to-date field data and closer relationship between registry and cadastral geo-data. This organizational model provides financial and personnel economy as well as flexibility of employing the decisions easily within the whole organization. Separate organizations for land registry and cadastre tasks creates further bureaucracy and requires more cooperation for cadastral works and property transactions (Gruber et.al., 2014; Jones, 2012). These two organizational models have some pro’s and con’s, regarding the process of property transaction. A property transaction process is accomplished in many steps, requires multiple official papers and takes long time to finalize. Even if the process is successfully finished, the transaction is always vulnerable against claims by unknown, lately appeared claims due to a missing document that hasn’t been archived by the organizations of land registry or cadastre. Particularly in the low developed or developing countries, land registry and property transactions are one of the most frequent titles among court cases, because of poor surveying and information gathering during cadastre works. This vulnerability could be resolved to an extend by employing a systems of participants whom mutually and transparently share all information among others as well as make decisions with fully participation. In todays DIGITALIZED era, people may participate all kinds of decision making processes by using the internet infrastructure under certain security, authorization and encryption. Our motivation raised from the cumulative cost of the poor cadastre and land registry operations onto the ordinary people whom has to rely on the political organization of the low-developed countries. Those countries depend on an economy and socio-economic relations based on land which is the very basic capital in those economies. Better cadastre and land registry means better economy, homogenous share of the welfare and prosperity, in the low developed, developing countries as well as developed countries. Despite the centralized systems controlled by a single authority for land registry, blockchain technology provides a revolutionary system and solution having the characteristics such as decentralization, openness, transparent for booking land registry with assured legal guarantee for transactions of property rights. Goal of using blockchain in cadastre is introducing the landowner participation into the boundary determination process which causes conflicts (Torun, 2017). The blockchain architecture is a network of nodes each of which has same or defined rights for corresponding transactions to be executed as approval of all relevant nodes. The traces of the transactions are maintained in all relevant nodes in chains of blocks. Any manipulation such as creation or updating of a transaction needs to be approved by relevant nodes/participants with their cryptography (ID and KEY). In this way, the transaction is executed and the registry (ledger) is updated in a safe way without a central authority. Even if a node disappears or quits from the system, the registry and track of transaction is safely maintained in the blockchain. A blockchain transaction is not completed, unless all relevant nodes approve it. The blockchain technology comes with a trade-off between redundancy and safety of transactions. This characteristic of blockchain technology makes it useable for registering such as land registry for land parcels and properties (Vos, 2016; Dijkstra et.al., 2015; Chachkhunashvili, 2016; Lantmateriet-Sweden, 2016). The ‘Blockchain Technology’ provides a framework to store, manage any information which is created during the lifespan of a cadastral parcel from surveying to property transaction. The operation of cadastre and transactions of land registry in a blockchain framework may ensure protection of the data and security. Cryptography in blockchain framework to maintain the confidentiality and integrity of the information protected, has to fulfill multilevel security requirements. The key and ID created for inter-communication between blockchain nodes may be maintained by the trusted -third party- node. The basic characteristics of blockchain such as data distribution and transparency enables all the participating nodes to validate transactions which eliminated the risk of data altering. As new chains of information (transaction) blocks added in a blockchain, a change in a transaction becomes almost impossible unless huge amount of financial investment employed Chachkhunashvili, 2016). Blockchain Database (BCDB) have the characteristics such as decentralization, immutability and management of any object as a registered asset. The concept of decentralization has three aspects; (1) geographically decentralization for security, (2) data centralization such that no-node has all data and (3) authorization decentralization such that nodes has the privilege to access with only hold IDs and KEYs to other authorized nodes. A BCDB consists of nodes, connections and any combination of these two. Realization of a node is a computer where a software supports BCDB runs, the connections are relationships between nodes both as a mean of data communication and user accessibility. A subset of nodes and relationships could make create a cluster. In case of a defined decision needed as a mutual authority, nodes could create a consortium under an agreement for decision making with membership and agreed policies. A Spatial BCDB has spatial-data-engine component either tightly-coupled or sparse-coupled to the BCDB system. Decentralization is employed such that a node only stores the KEYs of other nodes which allows, thus every node keeps a registry of KEYs but not all. None of the nodes is allowed to centrally store the KEYs. The level of decentralization is due to policy of consortium. A more relaxed decentralization may provide more resilience, however might create un efficiency for operations of transactions. By the way, the contemporary DBMS are managed by an ADMIN whom runs add/drop operation, which seems to be a contradiction, although ADMIN doesn’t have privilege to transactions since one doesn’t have ID and KEYs. A consortium can increase its decentralization (and its resilience) by increasing its jurisdictional diversity, geographic diversity, and other kinds of diversity. As being used in banking, finance, commodity transfer and asset management, blockchain technology provides an immutable data storage in the transactions under approval of all relevant parties. Booking land registry and transactions have similar characteristics like the current applications. Although, the aim of various efforts is different than each other, the common goal is digitization of multistep and long procedures without losing any information in the time-trace of land registry transactions. The secondary goal is executing the property transactions under eye-watch of certified authorities as well as all participants whereas the government applications are not so trustable. The goal of using blockchain technology in low-developed countries is mainly motivating people to register their properties against in a mutually recognized framework. The studies and pilot projects conducted in developed countries where stable and modern land registry and systems are in use, are aiming at lossless information in trace of property transactions. Thus, this technology could be used differently according to the cadastre and land registry infrastructure in a country. Although, all previous works on application of blockchain technology is towards the tedious property transactions, the complex characteristics of cadastre surveys could be managed in a blockchain database in order not to miss any tiny measurement in the lifespan of a parcel. The complex nature of cadastral survey comes from two sources; (1) the technological and legal improvements in time and (2) a fully and jointly approval of any survey by all stakeholders in any case. The first complexity could be handled by means of experience, legal and technical expertise. The second complexity compels any cadastral survey to be jointly-assured and jointly-approved by the land owners having the shared boundaries as well as the certified/authorized surveyor and the registrar who record the common understanding and decision among all relevant participants. Any kind of updating or repetition of cadastral survey requires the consideration of any previous raw and computed survey data, surveying decisions among others. Such a complexity forces the surveyors to make mistake or discard some of the surveying documents in the mass. Lack of technical, legislation and expert knowledge about surveying, description and delineation of the property in the field is not considered as a surveying problem in here, due to the definition of scope of this work. Some of the technical problems that are not taken into consideration are datum transformations, conversion between coordinate systems, dynamic characteristics of plate tectonics and its effect on coordinates, temporal characteristics of reference frames and QC/QA of surveying among others. Cadastre observations are providing the base geospatial information and information and location about the general boundary. Both the surveying and stake out surveying are data source of land registry. The registrar makes the decision based on the information collected by the certified surveyor in the field about area, general boundary, physical and usage features about the property. The mistakes, observation errors, evaluation errors made by field team cause further disputes as the registration done. In many cases, these mistakes are recognized when a property is to be sold third person whom wants the property to be shown and measured in the field. Dissolving the disputes are quite difficult by the courts after several years where limited data is stored. These kinds of problems could be prevented by using blockchain DB. Since the number of participants and data content changes, the DB has to be scalable, and supporting real-time transactions and pushing relevant data to the interested parties on the web which are not common specifications of the traditional database architectures where the architecture is built on user access, efficiency, consistency and analytical capability (Torun, 2017). As BCDB can store, manage and manipulate any kind of data, it is particularly useful for asset transaction under authority of multiple parties within a common decision base. Transactions for an asset are created by none/one or many participants in the BCDB to register the asset. The assets could be owned (created) by none/one or many participants and transferred to one or multiple participants. The assets are attributed and defined as non-dissolved, non-divisible as well as divisible. Transactions of an asset could be performed by mutual policy defined by the owners. The authorization could consist cryptographically sign due to asset definition. The transaction is verified as the conditions are satisfied due to definition of the asset. All the information related with an asset in a timeline and time trace are all preserved in the registry. In the studied example, the ‘Base Cadastre’ had been conducted in 2000’s, after first cadastral surveys in 1980’s. The surveys for base cadastre process comprises digitization of old cadastre maps, datum transformation and re-measuring the physical boundaries as well as staking the existing boundary out the field, if the boundary has no physical reference. Starting from the second half of 2010’s, cadastral surveys are needed to be updated due to poor surveying considerations that was previously done. The parcels xxxx/4 (The parcel numbers are not given by intention) and xxxx/5 have a common physical boundary –a stone wall- and a shared graphic representation in the cadastre data during base cadastre campaign conducted in 1980’s, (Figure 1.a). This boundary has been approved by the landowners at both sides of the bounding edge, namely xxxx/4 and xxxx/5. When the landowner of xxxx/5 passed away, the property sold to third party whom asked a certified surveyor to stake-out his land’s boundary. The concrete-metal fence has been built after the newly field measurement. The distance between two boundaries is 60 cm’s. The change in boundary with 60 cm, cause a difference of 21 m2 for the parcel for a total area of 525 m2, where the error limit is 9.6 m2 ( = 0.00042 x scale x SQRT (area)), due to error threshold in cadastre applications. To handle such a problem, the rights and approval authorization for data registration and updating are made possible by means of a CAD/GIS data structures which keeps a registry (ledger) of transactions that are shared among multiple partners in a distributed network of computers. This model is called ‘Blockchain’. In the Blockchain framework, the partners can manipulate (add, update, no-delete!!!) the registry and data in a secure way without the need for a central authority by using authorization right and using cryptography. In Blockchain model, the individuals could be enabled to access and manipulated the data whereas they are authorized along with public institutions (Bal, 2017; Dinh et.al., 2017; English et.al., 2016; Bartosh, 2012; Torun, 2017). A basic explanation of the proposed model blockchain technology is given in chapter 3.4 and a partial implementation of the proposed model is introduced in chapter 4. In Figure 2 a use case is given for cadastral survey of a boundary whereas four stakeholders on the property. The ‘land registry’ and ‘cadastre’ are authoritative and trusted nodes in the use case. The landowners having shared boundaries have approval rights for the transaction. The certified surveyor is not presented here because it has been assumed in cadastre. In the use case, one of the owners start the transaction by means of a ‘Request of Change’ to ‘Cadastre’. After preliminary preparations are made by the ‘Cadastre’, the draft outcome is presented to the owners. The preparations and the draft cadastre to fulfill the required ‘CHANGE’ may cover field survey under witness of the owners, necessary ancillary documents among others regarding the local cadastre and land registry law and regulations. As cadastral work is approved by both owners, the outcome is registered in the land registry book by the trusted ‘land registry organization’. As the request approved by the trusted node, ‘land registry’, a new block is added the blockchain which resides in all participating nodes. Then, any change could be done in the same way, but not even by the cadastre and land registry, by their own operation. In case of a dispute, the transaction could not be ended. In case of non-finalized transactions, all the data is stored but nothing changes in the state. The given use case seems not different from the current practice, indeed. The given approach in this paper enables the land owners to participate the process, provide their own ancillary papers, information and active approval into the process. In many low developed countries, the cadastre works and property transactions could be realized by cadastre and land registry without consent approval and decision of the land owner. Blockchain Database: Land Registry and Cadastre (LR&C) Blockchain Database (LR&C BC Database); The ‘blockchain database’ component handles the communication and trace of transactions. Middleware: LR&C Transactions Middleware (Python) Synchronizes the 'LR&C BC DB' and 'Spatio-temporal GIS/CAD Engine for LR&C Transactions' and Maintains Common Registry (Ledger); The ‘middleware’ component handles a lossless geo and non-geo data transaction. 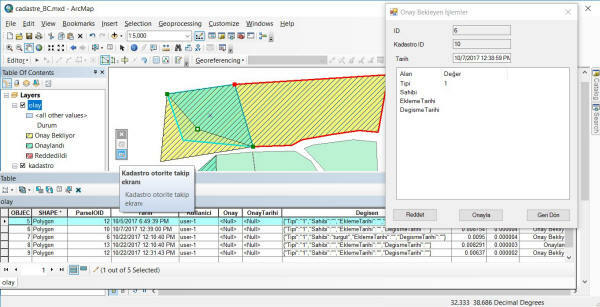 GIS/CAD: Spatio-temporal GIS/CAD Engine for Land Registry and Cadastre Blockchain Transactions (GIS/CAD Engine for LR&C BC Transactions); The ‘GIS/CAD’ component handles the geometrical part of cadastre survey. Each node has to have all components unless the community members decide in another way. For instance, the individual land owners need not to have the GIS/CAD component as a whole, despite other institutions which produce cadastre data such as ‘As is Plan’. The three components are briefly given in the following sub-chapters. LR&C Blockchain Application model has three categories of nodes namely; ‘Land Registry’, ‘Cadastre’ and ‘Land Owner’. The land owner node may have all characteristics of property owner such as individual or multiple ownership as well as institutional ownership. All the LR&C blockchain nodes, mutually create or change the states of assets. The application provides an interface for all the users at three categories. The ‘UserType 1’ category of users are institutional users whereas one is ‘Cadastre Organization’ and the other is the institute that requires approval and cooperation for cadastral data production or updating where ‘Cadastre’ has priority for transaction. The ‘UserType 2’ category of users is LR&C transaction authorized and approved by four participants namely ‘Land Registry’, ‘Cadastre’ and ‘Land Owners’ those have defined rights on the property. ‘UserType 2’ transactions are major changes about properties including boundary, use and rights. The ‘UserType 3’ category of users transactions have the same procedure and approval methods whereas these transactions are minor changes such as geometry which shall not change the main characteristics such as boundary and rights among others. A use case has been defined and given in Figure 2 for ‘UserType 2’ and ‘UserType 3’ type of transactions. Although we didn’t implement this module, we are planning to implement by using Python libraries. The ‘LR&C BC Engine’ performs transactions that are defined and approved by the ‘Community’ of interested nodes. A use case is given in Figure 2. The nodes are assumed to be honest. The BC Community may authorize one of the nodes to have superior role to monitor and watch the transactions as a ‘trusted node’ as a ‘custodian’. The custodian role may cover storing the land registry and cadastral data despite the other implementations of block chain databases. The ‘LR&C Data Model’ is a special data structure which maintains the states and the historical transactions for LR&C including the geometry data type. The data structure maintains the outcome of the final geometries created by the ‘GIS/CAD Engine for LR&C BC Transactions’ Component. The ‘Community Consensus’ is the set of rules for; IDs, KEYs, membership requirements for a node to be member in the Community, roles of nodes, procedures of transactions, uses cases among others. The ‘‘Community Consensus’ has the definition and description for GIS/CAD transactions and their time track in transactions. We are planning to implement this module by using Python libraries. The software are all open source. The computational base is designed on Linux based Ubuntu. The RethinkDB is a scalable DBMS which provides real time feeds to the data and push data to applications in real time. The RethinkDB architecture provides collaborative web and mobile apps, streaming analytics apps, real time marketplaces and connected devices. RethinkDB differentiate from other conventional DBMSs by sending data directly to the client in realtime that requirements of modern applications. The BigchainDB is the realized instance of database whereas each node may maintain, calculate and update new entries into the database. The BigchainDB establishes a secure network to enable all nodes to work together to ensure they are all coming to the same decision by means of common approval. The BigchainDB provides a framework to register, issue, create or transfer things/information into the instance of database. Basically, ‘create’ and ‘transfer’ are the main types of transactions of The BigchainDB. In BigchainDB, each block of information and approval that make a transaction are all stored in the database with an associated timestamp. The Middleware is a software that synchronizes the transactions performed by two components namely the 'LR&C BC DB' and 'Spatio-temporal GIS/CAD Engine for LR&C Transactions'. In our model, the ‘Land Registry Node’ and ‘Cadastre Node’ has roles such as maintaining the ‘Land Registry Book’ and watch the transactions. We are planning to use Python libraries to implement this module with support of sufficient security and encryption. The GIS module handles all data management such as approving a cadastre transaction, managing the changes in temporal geospatial databases with linked CAD data, booking and watching time traces of assets among others. The CAD module is responsible for performing the geometric part of the transaction unless the GIS module approves. Implementation of the cadastre transaction in a geo-data structure and a geodatabase in blockchain environment are presented in Figure 4 and Figure 5, respectively. The realization of initial prototype of the physical model is accomplished in ESRI ArcGIS programming environment, because of multiple functionalities. However, the realization of this component might be based on opensource technology after the behavior of the system and users are examined. On the other hand, for sustainability, the data and operations could be handled in cloud COTS SaaS. Currently, the communication between the GIS/CAD module and the other components are handled by using tokens and triggers. The ‘Spatio-temporal GIS/CAD Engine’ has the functionality of ‘GIS Engine for Cadastre Data Management’ and ‘CAD Engine for Cadastre Data Management and Transaction’. The GIS module handles all data management such as approving a cadastre transaction, managing the changes in temporal geospatial databases with linked CAD data, booking and watching time traces of assets among others. The CAD module is responsible for performing the geometric part of the transaction unless the GIS module approves. Implementation of the cadastre transaction in a geo-data structure and a geodatabase in blockchain environment are presented in Figure 4 and Figure 5. The realization of the physical model is accomplished in ESRI ArcGIS programming environment. The communication between the GIS/CAD module and the other components are handled by using tokens and triggers. At epoch ti , the state of the parcels are given Figure 4 (above frame), where all the relevant data such as parcel number (Parcel-ID), land owner (Owner) and other characteristics and property rights (Spec’s) at each node (NODEm and NODEn) are stable. At epoch tj, As both land owners and the custodian -which is the ‘Cadastre Organization’ in our model- approve, the transaction is executed where all new data are represented as ‘ * ‘ at the bottom of Figure 4. As the transaction is approved, all the relevant data at initial and update phases are stored in the BC database. At epoch ti , the geometries of two parcels are at stable state. At epoch t# , As, the landowner ‘A’ of parcel ‘N1’ at node ‘NODEm’ require an update, the draft geometries of the parcels are stored in a temporal data class where relevant data is prepared to update the parcels in case of approval by all parties. The parcel ‘N1’ is extended and kept in a separate data class so as the shrinking parcel ‘N2’, whereas these parcels are labeled as ‘#N1’ and ‘#N2’ respectively. At epoch tj , As all the relevant parties approves the transaction, the new state of the parcels are replaced with the old one in the current data class. In parallel process, the parcels at previous stage and the data created at update level are all stored in the ‘Data Class (Historical Trace)’. Figure 6 depicts the process flow and data flow in the implemented BC Cadastre (Editing) Transaction System. Any user interacts with the BC Cadastre Transaction System (BCCTS) via the same interface by means of ‘KEY’ and ‘ID’. The users are only allowed to start/request a transaction, access the data or any other given privileges through the ‘Current Data’. Started transactions are maintained in ‘Temporal Data’ until all relevant parties perform their role and approve the transaction within a given time period or given conditions. Another transaction cannot be started for the same entity, unless the current one is finalized or the transaction is dropped due to a rule of ‘BC Community’. In any case; either successfully finalized or dropped, all data is transferred into the ‘Archive Data’ to be stored. In the prototype, the temporal and archive data are stored in the same physical repository. Eventually, all data in archive is linked to the property that is currently in use. Any data in the ‘Archive Data’ is bound to a transaction by means of transaction ID which uniquely identifies participants, time track as well as all the previous and next state of the entity. Besides, the BC GeoDatabase maintains all text and geodata during the process of interaction. The geometries are stored as in GeoJSON format with a link to the database. As any user requests a previous geometry, the GeoJSON data is converted into a feature that ArcGIS can process by using the library of NewtonSoft.JSON. In the given interface in Figure 7, the request for geometry change (boundary change) by a user and the proposed new geometry along with the previous old geometries are accessible by relevant users for approval. As all the parties approve the transaction, the approved geometry is transferred into the current data. In Figure 7, the red boundary represents the neighboring parcel, whereas the black boundary is the initial state of the parcel subject to transaction. The green (selected) polygon is one of the proposed change where the hatched green polygon with vertices is the second proposal for change. Both proposals are maintained in the dataset. As the trusted authority approves one of the proposals, the transaction is set and the new state of the parcel replaces the current state (black boundary). The current state, the proposals and any other geometry changes are all moved to the ‘archive dataset’. The prototype BC geo database has been developed on ESRI ArcGIS by using C# and libraries of ArcObjects COM components. The ESRI ArcObjects SDK for .NET has been used to code this application. ArcGIS GeoDatabase is designed to support the integrity conditions defined in the use case. As the scope of this paper is, developing a prototype to perform geodata transaction to prevent boundary errors, the non-relevant cadastre information is not modeled in the geodatabase. The interface is realized as an ArcGIS toolbox (ESRI, 2017). The state of an entity, information about transactions are stored in JSON, the temporal and archived geometries are stored in GeoJSON and current state of the geometries are stored in physical data set. Although this model seems a bit complex, this approach enables the system to maintain non-atomic, multi-level, multi-characteristics data as a manageable package. The conversion of attribute values in the ArcGIS geodatabase into JSON, the open source DLL, NewtonSoft.JSON is used. The NewtonSoft.JSON serializer converts types of .NET and types of JSON, in between (Newtonsoft, 2017). Architecture of the Node of Blockchain Cadastre Database (BCCD) and Data Processing having three components namely ‘blockchain database’, ‘middleware’ and ‘GIS/CAD’, is designed and the ‘GIS/CAD’ component is realized. The design and implementation of process flow and data flow are accomplished of the BC Cadastre (Editing) Transaction System. The realization of the physical model of BC geo database is accomplished by using C# and ESRI ArcObjects SDK for .NET and libraries of ArcObjects COM components. An open library of NewtonSoft.JSON is used for converting non-atomic attributes of text and geodata between .NET and JSON) GeoJSON. Starting from the beginning of this decade, requirement of deep and connected search for better understanding with all aspects raised concept of ‘semantic web’ and ‘linked data’ where ontologies and connections between data and objects are used from different sources on the Web. As the smart devices, sensors as well as large communication band width with almost full-time network connection, self-activating-smart things are becoming actors in digital globe which is described as Internet of Things (IoT). In such an era, the user of cadastral data are machines but not human; such as ‘navigation engine in a car’ for route optimization based on real-time traffic density data, current route lanes map derived from different data sources as well as data from smart sensors of other cars that are open to access. In this environment of the digitalized world, the owners of data are no more centralized, data from multiple sources has to be reconciled for accurate decision making where a new data sharing, de-centralized data approving, quality assurance and data delivery model and mechanism needed. Besides, democratization and decentralization of spatial data among multiple institutes and even individuals compel the Global Cadastre Community to search, find and realize new approaches where ‘data owner is the king’. In this study, after giving the basic information and definitions about blockchain technology, architecture for ‘Land Registry and Cadastre (LR&C) Blockchain (BC) Node’ has been introduced which handles cadastre surveying and property registration processes based on a given case study. The given case study defines the problem of two physical boundaries belonging to an identical cadastre boundary. In order to resolve this dispute case, a basic model of process and data flow is figured out in a use case. This use case is taken as a base to design the architecture of blockchain node which might prevent mistakes in cadastre survey and booking phases where the landowners are participating as an equal partner in the cadastre survey and decision making process. The ‘GIS Engine for Cadastre Data Management’ part of the ‘Spatio-temporal GIS/CAD Engine’ component of Land Registry & Cadastre (LR&C) Blockchain (BC) Node is designed and implemented as an initial prototype. The GIS module handles all aspects of geometry of cadastral parcel and survey and data management such as approving a cadastre transaction, managing the changes in temporal geospatial databases with linked CAD data, booking and watching time traces of assets among others. This study gives design and the implementation of ‘the GIS part’ of the component based on a given use-case which manages the geometry part of the BC transaction in the systems. This study is pioneering to use blockchain technology to minimize the surveying problems caused by incautious considerations and application of cadastral regulations at surveying and data manipulation phases where the landowners are regarded as equity partners in mutual decision making. In the proposed framework, the current authority and hegemony of the organization for cadastre and land registry is considerably limited for the sake of landowners. In this respect, although the time/money efficiency of cadastral survey may decline considerably, the quality of the cadastre data and appreciation of landowners be increased by avoiding costs of court cases. Dijkstra, P., C Lemmen, A De-Boer, E M Unger (2015): ‘Surveying the Future: Mapping the Bitcoins’, FIG Working Week, Young Surveyors Session. Gundelsweileri, G., T. Bartoschek, L.A.C. Marques de Sá (2007): Development in The German Cadastre, Bol. Ciênc. Geod., sec. Comunicações, Curitiba, v. 13, no 2, p.423-432, jul-dez, 2007. Torun, A. (2017): Hierarchical Blockchain Architecture for a Relaxed Hegemony on Cadastre Data Management and Update: A Case Study for Turkey, UCTEA International Geographical Information Systems Congress 2017, 15-18 November 2017, Adana, Turkey.